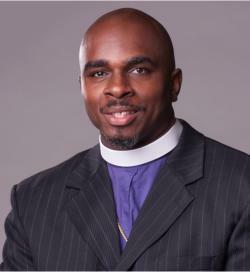 February 25, 2015 (Memphis, TN) Bishop Vincent Mathews, Jr. has been chosen to lead the International Missions Department of the Church of God in Christ (COGIC). Presiding Bishop Charles E. Blake, Sr. has, with the approval of the General Board of the Church of God in Christ, selected Bishop Vincent Mathews, Jr. to be the new president of the International Missions Department. Bishop Mathews succeeds Bishop Carlis Moody who served admirably as president for over forty years. Bishop Mathews is the jurisdictional prelate of the South African First Jurisdiction and the pastor of Tabernacle COGIC in Ivory Park, Johannesburg. For the past 10 ½ years, Bishop Mathews and his devoted wife, Sharon Mathews, have served as full-time COGIC missionaries in South Africa. They have been married for 21 years and have 10 children. Bishop Matthews was born in the United States and left a lucrative career in education to go on the mission field. He received a BA from Wayne State University in Detroit, Michigan, an MA from the University of Illinois Champaign-Urbana and a Doctorate of Theology from North Carolina College of Theology. He has authored six books and loves the ministry of worldwide missions.